Verse 42 says “as evening approached”. According to Jewish time keeping, the Sabbath started at 6pm, only 1-2 hours away, when all work was not allowed, hence the urgency to get Jesus body down the cross & into a tomb. I have set this scene at about 4:40-5pm. The setting sun (unseen on the right of the picture) provides light for the scene, with pale yellow edges to the right of people & objects & shadows on the left. From left to right: John (son of Zebedee), Salome, an un-named girl in green (seen in previous scene), Mary Magdalene. Jesus’ body is being lowered by linen fabric by a servant, with two servants at Jesus’ feet helping. Joseph of Arimathea (in purple) with more linen cloth on his shoulder, with Nicodemus, both looking saddened. Mary (the mother of James the younger/less and of Joseph/Joses) (see verse 40) is not visible in this scene. This scene forms part of the Easter series, from Mark’s Gospel. There are two versions of this scene, this one (the Colour version) & the alternate (the Shadow version) which is on the next page. In this Colour version I have omitted the blue shadows so that the full colour of all the figure’s clothes, skin, hair, etc can be seen. The Shadow version has an overlay of blue which tends to mute all the colours of the figures. I did this to indicate the failing light, as the sun goes down. Lower light levels (as dusk approaches) tends to reduce tonal contrasts – hence the blue overlay in the shadow version. I have included both versions to cater for different customer needs: some people like brighter colours, so people are after more atmospheric lighting. a photo’ of a re-enactment of the crucifixion. In the picture long strips of linen had been secured to the torso of the “crucified” person (an actor) & were being used to counter-balance & support the weight of the body as it was lowered. That seems to make sense to me as a means of lowering the body to the ground, prior to being bound in grave cloths. Several people would be needed to perform this act, some to support the weight of the body at the front, as it was lowered, & at least one person gradually feeding the linen cloth over the crossbeam. 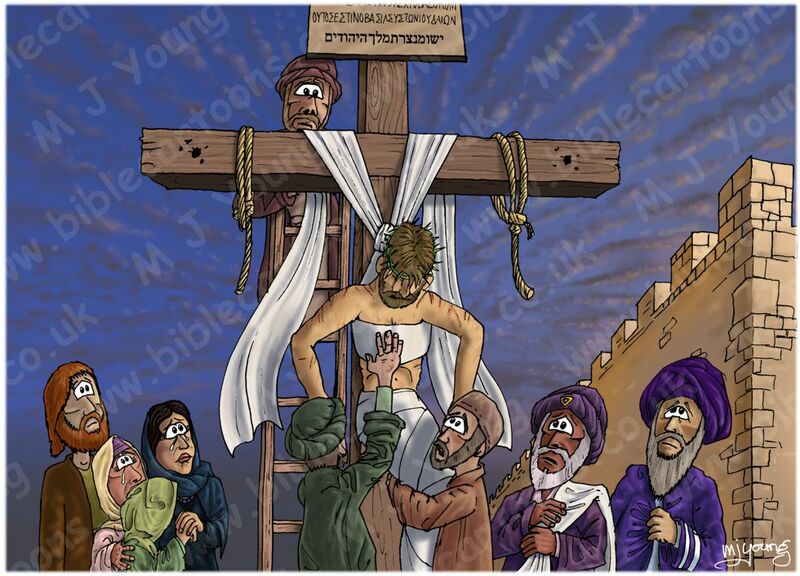 In my picture you can see a man (a servant either of Joseph of Arimathea, or else of Nicodemus) up a ladder, at the back of the cross, who is guiding the lowering of Jesus’ body, by means of the linen strips I mentioned. Two other servants, at the foot of the cross, are helping to support the body of Jesus, as he is lowered to the ground. Notice I have shown Jesus’ legs bound in the linen at this point. I have included some of Jesus’ disciples/followers as I reasoned they would most probably be there to see his body safely entombed. 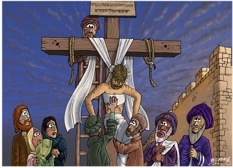 Besides, I have drawn the particular figures (on the left of the cross) in previous Bible Cartoons, & it makes sense (from a continuity point of view) to include them here as well. Although Nicodemus isn’t directly mentioned in Mark’s Gospel, he is in John’s Gospel *1, & so I have decided to include him in this picture. 38 And after this Joseph of Arimathaea, being a disciple of Jesus, but secretly for fear of the Jews, besought Pilate that he might take away the body of Jesus: and Pilate gave him leave. He came therefore, and took the body of Jesus. 39 And there came also Nicodemus, which at the first came to Jesus by night, and brought a mixture of myrrh and aloes, about an hundred pound weight. 40 Then took they the body of Jesus, and wound it in linen clothes with the spices, as the manner of the Jews is to bury. 41 Now in the place where he was crucified there was a garden; and in the garden a new sepulchre, wherein was never man yet laid. 42 There laid they Jesus therefore because of the Jews’ preparation day; for the sepulchre was nigh at hand.